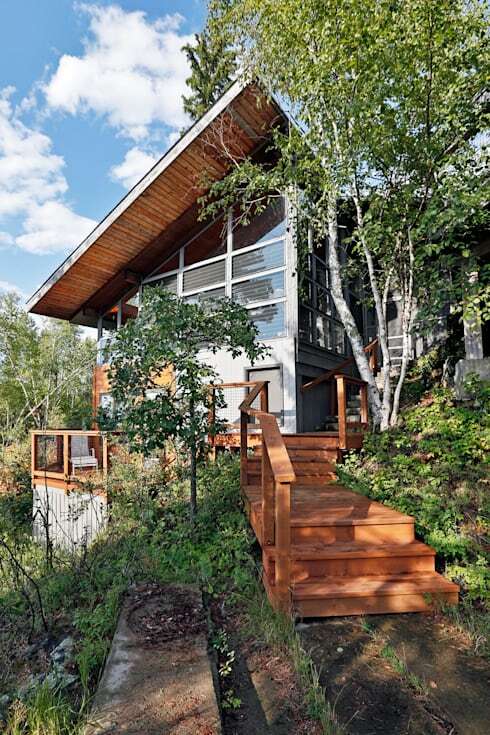 Travel to West Hawk Lake, a scenic natural site located on the border of Manitoba and Ontario, where the architects from Unit 7 Architecture have manifested another of their striking contemporary summer house designs. This tour explores a renovation project project in which the architects have performed a significant reconfiguration of the structure's original layout, opening up the rooms to allow for a grand, spacious interior. The architects completely removed the lower existing lower level, refitting the space with bedrooms and ensuite with a private lake view. 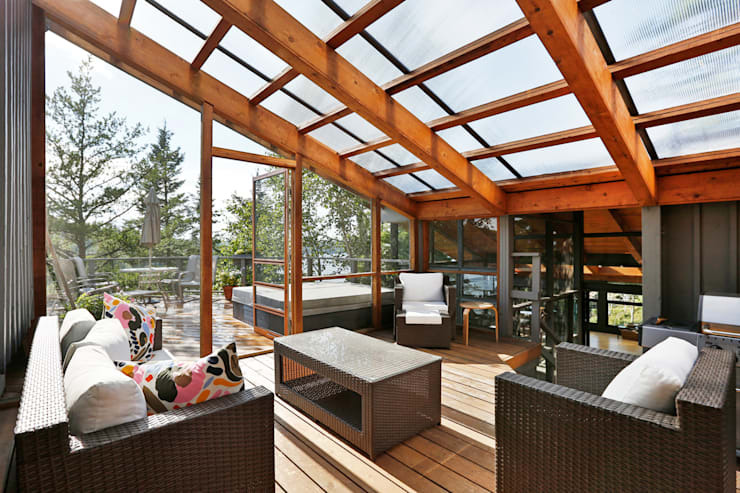 Located on a prominent granite cliff that overlooks West Hawk Lake, the seasonal cottage occupied a prime location but lacked the windows through which to fully enjoy it, and so the architects have added many windows to enhance both the views and the quality of light throughout the interior. The finished product is a dynamic and accessible space in which the family can enjoy spectacular lake views from every room in the house! The natural environment has been given due attention in this renovation project, which embraces the topography and fauna of the surrounding landscape. This new wooden deck provides easy access to the outdoors without stepping on any toes – the architects have thoughtfully integrated this man-made feature into the existing scape, wrapping around the slope and allowing the nearby trees to closely embrace the new design. 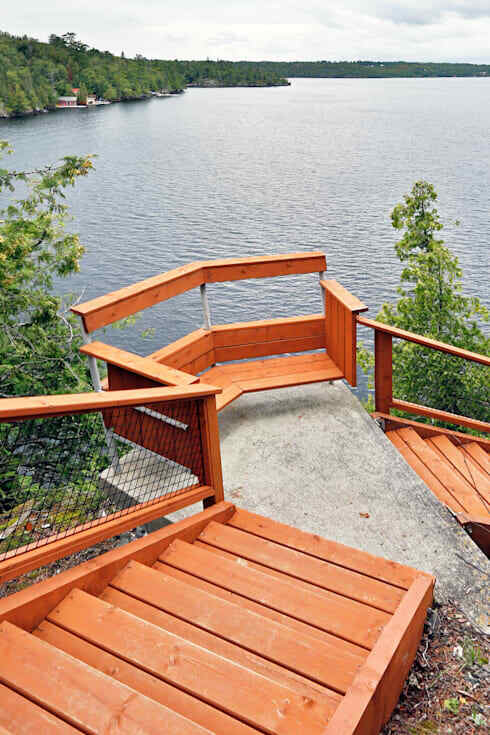 The home's location on a bluff can be fully appreciated from the seat of this wooden bench, which provides a contemplative moment of pause as you descend to the stairs towards the water below. Although this is a renovation, the interior has been entirely reconfigured, now offering unobstructed living space that blends seamlessly as you move through the elongated common room. The long side of the home now takes advantage of panoramic views through an array of window panes and skylights that serve to open up the space, with sunlight able to reach every corner of the effortlessly open layout. 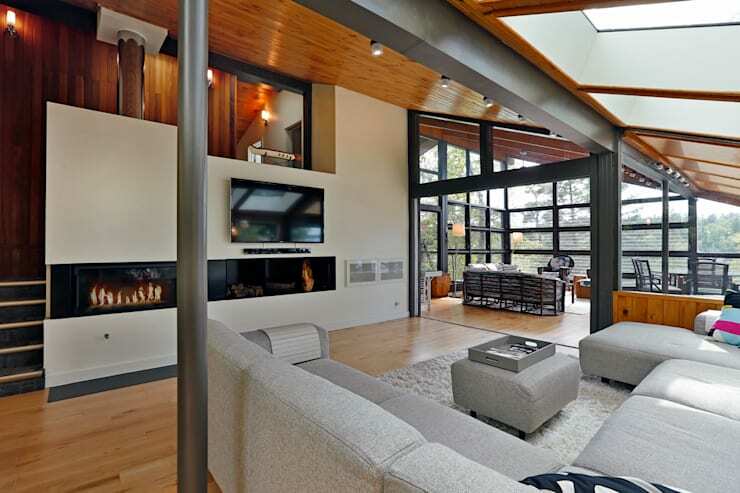 The architects play with the elongated nature of the home with this unique living room scene, in which an extraordinarily long fireplace poses as a thick horizontal stripe in the center of the space. Likewise, an extensive sofa takes advantage of the newly opened space, stretching out generously across the room – and why not? This design draws strong horizontal lines through the use of beams, planks, and stripes, in addition to the orientation of the furniture. The large floor plan offers ample space for fostering that elongated, extensive, and laid-back sense. The interior scheme is characterized by energetic and structured lines, softened by the addition of colourful furniture, soft fabrics, and playful patterns, as seen in this view of the living room. With bold rectangular windows and exposed structural beams placing a strong emphasis on square angles and intersections, the warmth and cheer provided by a plush rug and patterned pillows makes an artistic – and high impact – statement! The sunroom was a new addition to the home. Two large glass panels have been retrofitted to slide away into a pocket wall, creating a seamless and obstacle-free connection as the family ascends the stairs into the sunroom space. Translucent panes soften the light that enters the room, creating an ambience that's well-lit but never squinty – for full sun, the family can easily pass through the wood-framed swinging door onto the sun deck, where a hot tub and patio chairs are begging to be enjoyed. 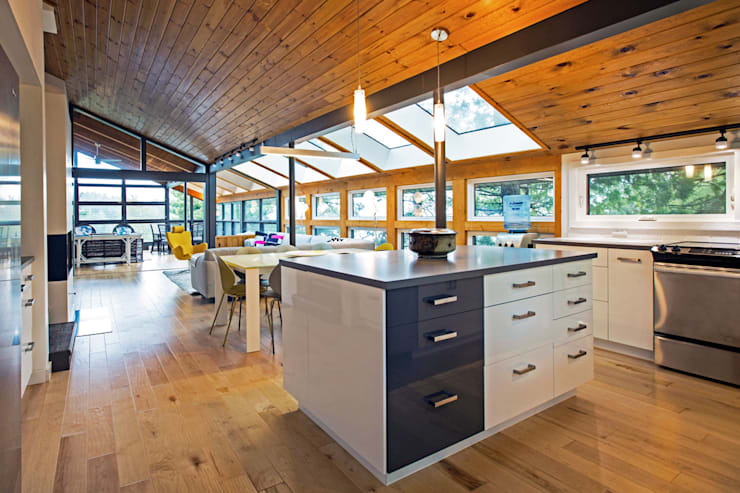 Share your insight on this contemporary lake house design below!